Andi Grupa loved The Hunger Games movie, and her teenage son Cody had read all the books. When she heard she was going to have the opportunity to provide TapSnap phototainment at the Catching Fire movie’s advance screening event on November 18th, she was thrilled. The event, organized by TapSnap’s corporate offices, was a major social media promotion for the movie launch in 24 selected cities across the United States. “We were a brand, spanking new franchise. We showed up at the AMC BarryWoods theatre in Kansas City and everybody was excited and smiling. When the event planner rolled out the red carpet, everybody clapped. We didn’t have one photo the entire night where people weren’t smiling and having a blast,” says Andi. Andi and her husband Scott were new franchisees who had just launched their business at the beginning of November, but they made sure they were ready for Catching Fire by scheduling a few practice events before the big day, and having several friends over to try out the machine. “The kiosk was very easy for us to pick up and learn. 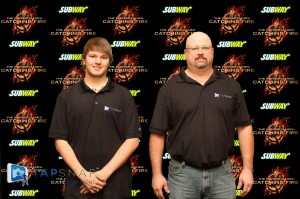 When Catching Fire came, we were ready and totally excited to be a part of it. It felt… HUGE,” she says. Andi set up her TapSnap machine at the end of the red carpet, so fans could walk down the red carpet and pretend they were the stars. Some even came in full Catching Fire costume, complete with braided hair, and many had Catching Fire T-shirts. “You could see the amazement in their eyes when they saw how the green screen changed the photo background to the Catching Fire logos,” she says. Andi and the movie theater manager amped up the excitement event more by going around and pretending to shoot fans with mock arrows. While Andi was doing the Catching Fire event in Kansas City, Mo. 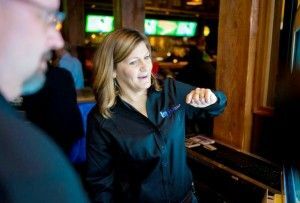 her husband Scott and son took their second TapSnap machine to another advance screening in St. Louis, Mo. “He says people kept coming up to him amazed and asking, ‘What is this?’ and everybody was ready with their Catching Fire poses like the three-fingered salute,” says Andi. 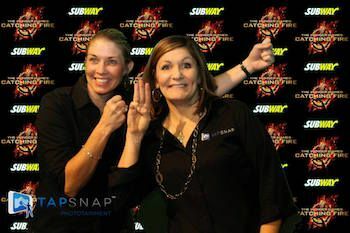 She recalls a conference call with TapSnap’s corporate office event coordinator Claire Nagle and the other franchisees working the Catching Fire event. That’s all behind her now, and ahead are parties and special events, weddings and bar and bat mitzvahs. If it’s anything like Catching Fire, she’ll be having the time of her life.